Has a very rich black color. Applies well and smudges easily. Cheap. I bought it for $10 SGD at Sephora. Can be applied as is yet already very intense. It gives you bigger and bolder eyes. 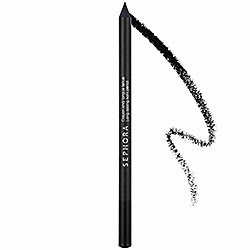 Some of the kohl eyeliner pencil residue falls into the natural lines and folds on the upper eyelids which makes it appear like dirt building up. This is how it looks like when I applied Sephora Long Lasting Kohl Pencil in the morning. After 12 hours, below is how Sephora Long Lasting Kohl Pencil looks like. I didn't do any retouch to see the difference. The makeup residue usually falls into the natural lines and folds on the upper eyelids which looks like a dirt buildup so it's important to smudge it using a smudge brush or a even fingers as long as it's clean so that it won't look gross. It looks like I just applied the Kohl pencil on my eyelids. Check out my post how to apply kohl eyeliner. Its my first kohl eyeliner pencil so I cannot compare it to other kohl eyeliner pencils available in the market. But I actually like the product except for the build up on my eyes which is not really that bad since it's smudge-able. For me, I like the product and it's a value for money. this sounds really good...vl definitely check this one out!